The EU-funded ¡VAMOS! project in which the European Federation of Geologists (EFG) was a partner ended officially on 31 January 2019. Therefore, the project partners met in Brussels, on 30 January, for the review meeting with the European Commission’s project officer. 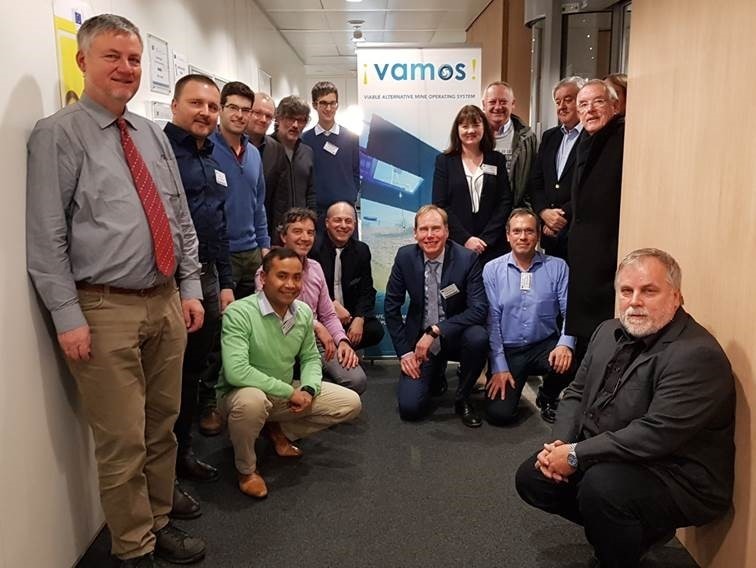 The aim of the review meeting was to look back on the actions carried out during the past four years, designing, producing, assembling and testing, the ¡VAMOS! project. ¡VAMOS! aimed at enabling access to high-grade EU reserves of submerged, deeper-seated minerals by developing a new safe, clean and low visibility mining technique that proves that currently unreachable mineral deposits can be extracted in an environmentally and economically sustainable way. The ¡VAMOS! team affirms that this key objective was met: the team has produced and tested a new mining technique that delivers greater environmental and economic value than conventional mining techniques. This was also confirmed by the European Commission’s project officer and external reviewer who evaluated the ¡VAMOS! project positively during the meeting. EFG contributed especially to the project’s stakeholder engagement activities, organising two workshops with stakeholders (in the UK and Portugal). EFG was represented in the review meeting by Project Officer Alberto Sánchez Miravalles. A visual representation of the project activities can be seen in the project movie.